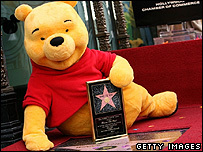 The loveable character Winnie the Pooh has been awarded a star on the world famous Hollywood Walk of Fame. Pooh joins other famous Disney characters Mickey Mouse, Donald Duck and Snow White, who all have their own star. However, there are still less than 20 animated characters to have received this award, but it still reflects how animation has become a mainstream part of Hollywood entertainment. Pooh was the 2,308th celebrity to receive the award. Pooh was there to see the star for himself. He was also joined with friends from Hundred Acre Wood - Tigger, Rabbit and Eeyore. The CEO and President of Walt Disney, Robert Iger, was also in attendance. The ceremony took place by El Capitan Theatre. The award also celebrates Pooh's 80th birthday and his new DVD that it about to hit the shops (Pooh's Grand Adventure: The Search for Christopher Robin). The British author AA Milne first wrote about Pooh in 1920s for a London newspaper in a piece called Winnie the Pooh and the Honey Tree. The name of the bear came from the stuffed bear that was given to Milne's son, Christopher Robin Milne. Now, the classic stories have been translated into more than 40 languages, multiple films and series have been produced, and the franchise pulls in $6b in annual retail sales. You can watch a video of the ceremony on the BBC website.